$6.45 for shipping & handling in US only. This is included in the price shown. Price includes shipping in US. Shipping outside US available. The book is also available with a fiber and child safe dye kit. Call (719) 495-6693 for pricing and ordering the book with the fiber and dye kit. 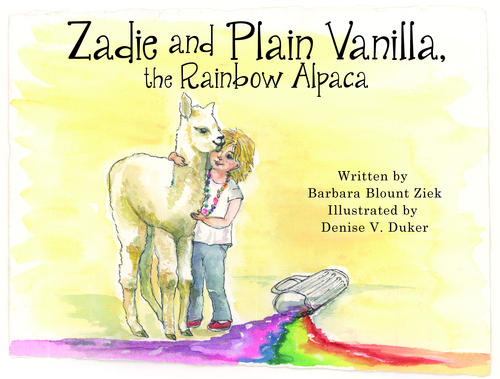 Zadie and Plain Vanilla, the Rainbow Alpaca is the story of a young girl whose grandfather promises that the next cria born on his farm will be hers! Zadie loves all the natural alpaca colors and wonders what color her alpaca will be: lavendery rose gray, shimmering black, peanut buttery or chocolaty brown? The cria is a disappointing plain vanilla white. She is a mischievous cria and in the Frooty Bright fiasco, becomes a rainbow alpaca! + A fiber arts project follows the story in the book: child-safe powdered drink mix dyeing, wet felting beads with the dyed fiber lead to a felted bead necklace. YouTube videos on this web site will demonstrate the techniques taught in the book. + After the fiber arts instructions, you will find pages of alpaca facts and anecdotes will acquaint readers with basic alpaca facts and anecdotal information about alpaca behavior that inspired the story. + An Alpaca Fiber Resources page in the book will direct readers to alpaca farms who sell alpaca roving to readers who need more fiber to pursue their new hobby. + The book is meant for children and parents and grandparents or caregivers to enjoy and explore together. 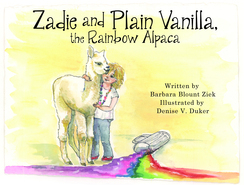 Younger children, ages 4 and 5, will enjoy listening to the story being read to them. Children this age will love watching the magic of dyeing the fiber. They will benefit from larger adult hands helping them with the felting process. + Older children will love reading the story by themselves and will need minimal help.